A short guide to help you deal with credit card debt, as consumer debt in the UK continues to spiral. You don’t need to work for the Financial Times to realise that credit card debt is getting well out of hand. Ten years ago hardly anyone had one. Now there are 91 million credit and debit cards in the UK. Two fifths of our shopping is now put on the plastic. The net result is a large portion of the population with massive credit card debt. Given the extortionate interest rates charged this is seriously bad news for us and the source of gleeful hand rubbing for the high street bankers (what’s that rhyming slang for I wonder?) who are pocketing it. We see it like this. Credit cards have been introduced not to make our lives easier, but to extract money from us. Credit card debt acts like a mini mortgage – got to keep our noses to the grindstone so as not to miss any payments. We lived without them for years, and can start doing so again. To help you on your way to liberating yourself from plastic purgatory we have our “Cut it up” campaign. The first step in taking part is as easy as you make it. Get your credit card and take a pair of scissors to it. This may seem hard at first, but believe me, the feeling of relief when its done is immense. Worried about the debt you’ve accrued? The most important thing is not to panic. There’s plenty of free advice you can get out there, and things really might not be as bad as you think. For starters, did you know the following? 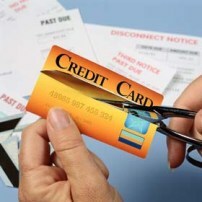 Credit Card debt is classified as “non-priority” debt. You can’t be imprisoned for not paying non-priority debts and you are unlikely to lose your home or your essential goods. It is an offence under The Administration of Justice Act 1970 (amongst others) for someone in debt to be harassed by their creditor such as a credit card company or an agent acting on their behalf. Debts of under £5000 can only be heard at the small claims court. So even if you do get taken to court you can’t be stung with solicitors costs if you lose. Debt collectors are not the same as bailiffs. Debt collectors cannot take any action against you, apart from asking you to pay any money owed. Alternatively, you could visit a local Citizens Advice Bureau.